The other day I took a trip to the Ronald Reagan Presidential Library because my power was out. I knew that there was a football exhibit going on but I wasn’t expecting enough content for a blog post. I was mistaken, as there was some awesome stuff there. Truth is: I may take it for granted as I live in the same city as the library. 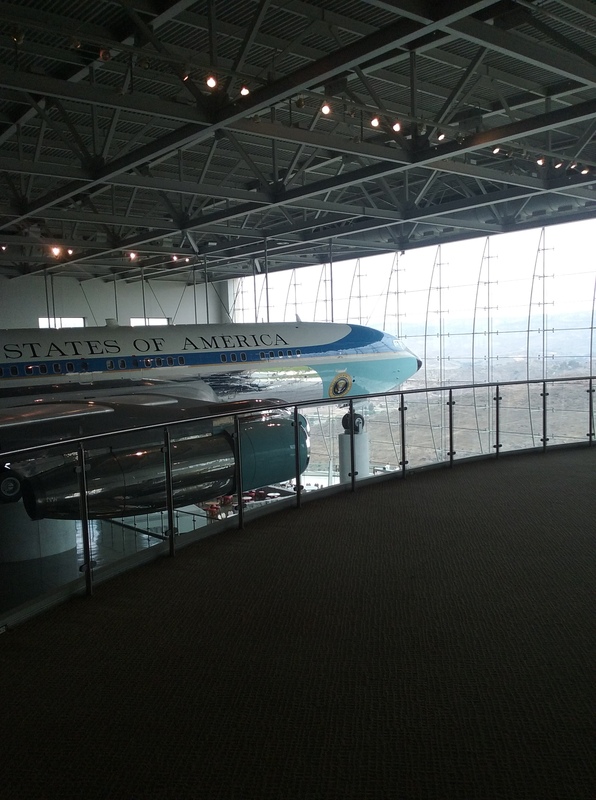 The highlight of the place is Air Force One. I know that it is not card related, but I have been seen it and been in it about ten times now, and the novelty never wares off-and this is coming from someone who hates airplanes. This thing is amazing. Moving on to The Football Exhibit. I wasn’t expecting the expecting the exhibit to have cards but there was a ton. Cards from the 1950s were on display, as well as 1890s tobacco cards. I had to take a picture of the ‘deflategate’ exhibit. It gave me a good laugh, as well as the old lady who was behind me. She actually encouraged me to take a picture of it because of the absurdity. The balls were tied to a string so you couldn’t pick them up, but the only difference was the size of the ball. The ball that was deflated was smaller so you can probably put more distance in your throws but that was it. It certainly did not feel deflated at all. That said, Tom Brady beat my Carolina Panthers in a Super Bowl so I still side against him. I was in awe of the Heisman Trophies on display. To me, with the exception of the Lombardi trophy and Stanley Cup, that is the trophy. I got weak in the knees, and that is probably why my photo is blurry. The trophy is huge. They had Lombardi trophies on display and those looked tiny in comparison. I am 6’5, 200 pounds and to tell you the truth, I would probably have trouble lifting the Heisman. My other favorite was a Notre Dame team set that Reagan kept in his desk. Ronald Reagan was a collector. He was one of us. I strongly suggest that everyone check out the exhibit as soon as possible The Ronald Reagan Library is in Simi Valley, CA. If this is a little far for you, I suggest making a day trip of it and going to Dallas Cowboys camp in Oxnard which is in the same county. The Reagan Library is worth the trip even without this exhibit. I would recommend this for Democrats and Republicans because Reagan was a great Liberal Republican President. The library has so much to offer besides this, it’s not even funny. I have already gone there 3 times this year, and I find something amazing every time I go. If any of the readers check it out, let me know. I have a pass there and would gladly meet you there.